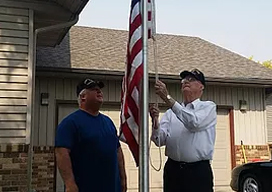 ND Flag Pole Guy proudly offers our “Flag Over Vets” program for flag retirement. There comes a time when flag repair is not an option. After you buy an American flag and it has reached the end of its service life, be sure it has a proper final resting place by contacting us. It is important the flag be retired according to the flag code, so please reach out to our team. 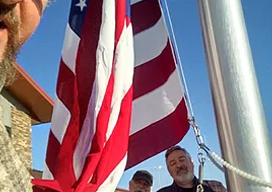 If you purchase a flag online from us, we will send you a box with the postage included so that you can send your flag to a place of respect and honor. Those who buy a flag from our American flag store can also select the option for the return box. This allows you to properly send off your old, tired flag and proudly display your new one. We believe in caring for flags at all stages of service, from the very first wave to the final flag-lowering ceremony. Allow us to give your retired flag a proper send-off. After you send your flag to the above address, please fill out the form below so that we can acknowledge your flag retirement. Thank you!